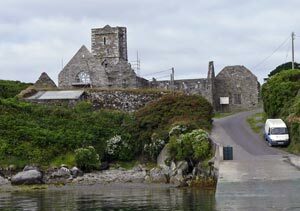 ABOVE: The approach to Sherkin Island and the 15th Century Friary by passenger ferry. INSET BELOW: The Islander's Rest on a hill above the harbor. Sherkin Island (Inis Earcáin in Irish) is only 10 minutes from Baltimore, Ireland by passenger ferry, but it feels more isolated from the Irish mainland than you might guess. For one thing, the only cars on Sherkin belong to the islanders, and there aren't many of the latter: The local population is less than 100 for most of the year, down from 1,000 or so before Ireland's Great Famine in the mid-19th Century. Most visitors come to Sherkin Island for pleasant country walks, sandy beaches (uncommon in this part of Ireland), birdwatching, and coastal views. Sherkin measures about 3 miles long by a mile and a half wide (5 km by 3 km), so you're unlikely to get lost if you just follow the roads around the 1400-acre island. Still, I'd recommend buying Map 88 of the Ordnance Survey Ireland's Discovery Series, which covers Sherkin and the other islands of Roaringwater Bay. The main accommodation on Sherkin is The Islander's Rest, whose proprietor, Mark Murphy, lived in Boston for a number of years before returning to Sherkin and buying the hotel in the mid-1990s. The Islander's Rest has 21 single, double, twin, and family rooms with private facilities, a bar, and a breakfast room/restaurant with large windows overlooking the harbor. Nearby, the Seahorse Marina offers boat moorings with showers and toilet facilities at The Islander's Rest. Sherkin Island also has two small B&Bs and self-catering cottages, the Jolly Roger Pub, and a general store that doubles as a post office. Shoppers can buy knitwear, jewelry, and other goods from local artisans.